The launch of the Sigma SD9 camera with the Foveon matrix was the focus of attention last year. The announcement of the matrix was followed by multiple articles trying to analyze its prospects. I have nothing new to say about its ergonomics and management. For those who use photography in their work, i.e. reporters or photo artists, there is no difference between the matrices: CCD of the Nikon D100, CMOS of the Canon EOS D60 or Foveon of the Sigma D9. These cameras are of absolutely the same class, and the determining factors will be removable optics, layout of buttons etc. Just note that the Sigma is rather a prototype today than a real working horse. The difference between the camera with the Foveon matrix and cameras with mosaic filters is significant for those who register images for further analyses. When the camera is used as a measurement tool, it's important to understand what is an observed value and what is a result of interpolation. The attempts to give up mosaic filters took place before the Foveon matrix as well. For example, the Minolta RD175 camera used three matrices with single color filters in front of each. Such approach is popular with video cameras as well. But the necessity to divide a light flux so that it gets onto three independent matrices brings about the requirement of precise overlapping of three images, which is not an easy problem for 1Mp cameras. The principle difference between the reviewed cameras is how the visible spectrum is divided into frequency ranges. The Canon uses zone filters located in front of every sensor. 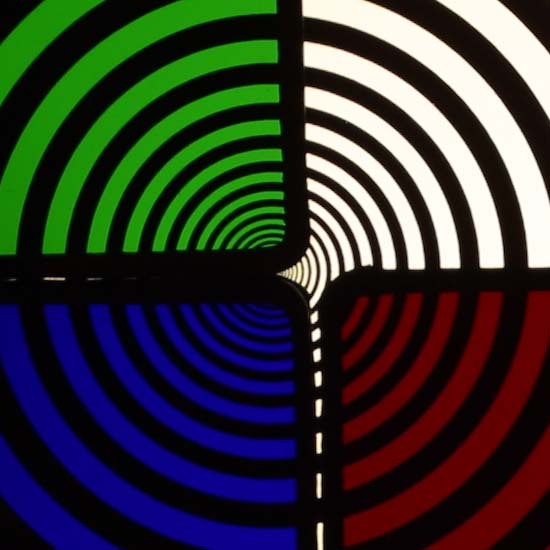 The Foveon matrix uses the fact that photons of different wavelengths are absorbed in silicon at different levels of depth. The expected spectral sensitivity of the Foveon matrix is given in the above mentioned review. Let's look at the spectrum of a halogen incandescent lamp KGM KÃM 250 obtained with a gitter. The cameras (in turn) were attached to the tripod, an image was registered in the RAW format and then converted into TIFF and transferred to Photoshop. The white balance was set for daylight because we wanted to register exactly the spectrum of the incandescent lamp, not to shoot an object it illuminated. As you can see, the spectrums are quite different. While in the Canon camera the spectral sensitivity is defined by zone filters, and the effect of the filter located in front of the matrix which doesn't let IR radiation pass through is almost unnoticeable, for the Sigma the restrictions in the long-wave part are on account of this additional filter. 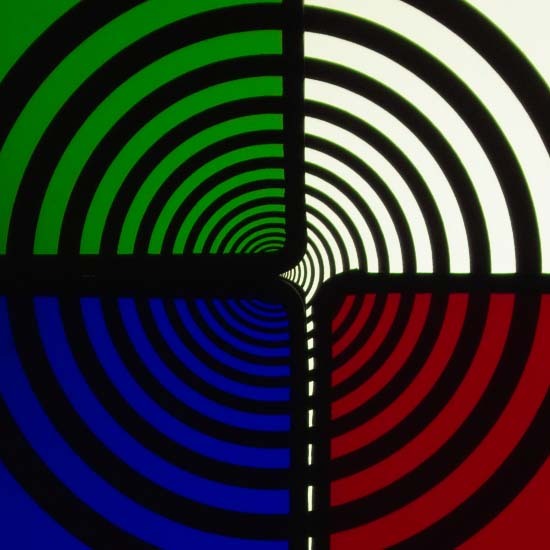 In the range of 530-550 nm the Foveon matrix registers a signal only in the green channel, and the signal's value doesn't depend on the wavelength, while the Canon has a very narrow band where signals in the blue and red channels are lacking at all. We can't say which camera shows the original spectrum more precisely, there is inaccuracy in both cases. But the error will be different for different wavelengths. For example, the Sigma poorly discerns the difference in the tints of the green color at around 550 nm; but it's able to register much more minor differences at around 500 nm in contrast to the Canon. If we shot a laser beam of 500 nm, the Sigma's camera would fix it as blue and green, while the Canon's solution - as almost pure blue. The wavelengths I indicated are approximate and can differ by 10-15 nm. The yellow part of the spectrum will also be delivered differently by these two models. In the red range the Canon's sensitivity gradually reduces as the wavelength gets shorter, while it hardly changes in the whole red range in case of the Sigma's solution, and as I mentioned before, it is sharply cut off with an external filter. If we take it off (which is possible in the Sigma because it's located in front of the mirror and easy to reach) the camera could shoot in the near IR range. Now we are to shoot the resolution chart through zone filters lying on the light table which uses a luminescent lamp of the conditional color temperature equal to 8000K. When shooting with the Sigma the signal amplitude graphs remain square irrespective of the zone filter's color even in case of thin grooves, while with the Canon the squares turn into a sinusoid quite quickly. The latter is able to register brightness different from zero of only 1.5 million pixels behind the blue or red filter, while the Sigma always registers 3 million. The image is similar for the green grooves, but the number of elements sensitive to this spectral region is equal, - 3 million. That is why 6 million sensors behind the mosaic filters can be an advantage only with a black-and-white resolution chart of the absolute contrast. Now let's see how a noise level depends on sensitivity using the same shots. Here you can see histograms of brightness of the pixels on the image of 100x100 pixels which shows several black and white grooves behind the zone filter. At ISO 100 the width of the peaks corresponding to the black pixels and white ones is almost the same. The difference in the width for the image made with the red zone filter is probably caused by the fact that the filtering areas of the Canon do not overlap, which makes the signal weaker in the red range. Finally, let's compare the resolution charts of the absolute contrast. In the center is a shot made with the Canon's camera, on the left you can see the original image made with the Sigma's camera, and on the right we have a shot made with the Sigma, with the size brought in the Photoshop to the Canon's shot size. The shots are taken in RAW, converted into TIFF, combined in the Photoshop into one image and then recorded in JPEG. 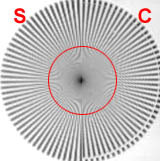 As you can see, the Sigma has a higher groove/pixel resolution; the resolution of the shots brought to the single size is almost equal, but if the image remains black-and-white for the Sigma, the Canon allows for a color moire for thin grooves, because of the different frequency of the elements sensitive to the different spectral distribution. If we convert the image into gray, then turn the chart made with the Canon by 45 degrees and match the images, we will get almost identical moire pattern and resolution for these cameras. The image is enlarged twice. 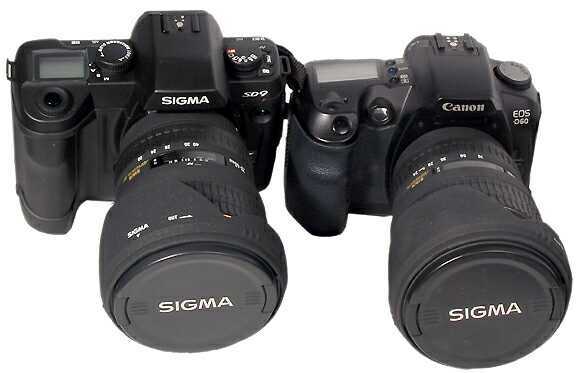 The Sigma hardly yields to the Canon's camera. The arithmetic is right, and the average between 3 million pixels of the image and 9 million sensors gives the same result as 6 million registered pixels and 6 million sensors. The Sigma's model has specific spectral characteristics which can be useful in scientific researches. And it has a better resolution than cameras with mosaic filters when shooting color grooves on the white background or black grooves on the color background. The line of the Sigma's lenses is rather wide and can satisfy both reporters and photo artists, but the situation with optical systems for scientific researches and adapters for scientific equipment is not so good, and you will probably have to make them yourselves. It's possible from the technical standpoint, but taking into account that the film cameras of Sigma were never positioned for this sphere, and third parties never produced adapters for the Sigma's bayonet, it's questionable whether Sigma will be able to get its share on the market of scientific equipment, or someone else would make a camera with the Foveon matrix for the M42 lens.